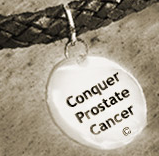 When it comes to prostate cancer support there's an aphorism which I believe has great relevance: "To the world you may only be one person, but to one person, you may be the world." This observation applies in many arenas of our lives, including the way we take care of those in need of prostate cancer support. Think of the tremendous value you bring to a single person with an illness like prostate cancer or breast cancer among various diseases. When meeting him or her do you speak words that hurt or heal? When people are in pain or under stress, do you let them know you’re totally there for them, or are you at a total loss of words? Do you use your actions to resolve or obstruct others’ quest for solace? Do you address another individual’s problems, or find yourself evading or even compounding such a person’s concerns? Expecting too much of ourselves can lead to endless frustration. It's virtually impossible to change the lives of the millions and billions of people "out there." All that's expected of us is to do our best wherever we are, as we each reach out to one person at a time. "To the world you may only be one person, but to one person, you may be the world."